Donald Trump plans to send 5,000 troops to the country’s southern border, a massive increase from the 800 originally planned, in order to secure legal ports of entry, the Wall Street Journal reports. The troops are expected to remain there through mid-December, as a caravan of migrants seeking asylum from Central America works its way to the U.S. border with Mexico. Sending troops to the U.S.’s nearly 2,000-mile-long border with Mexico isn’t a new idea, as Quartz wrote earlier this year, when the White House asked that thousands of National Guard troops head south. In fact, both presidents Barack Obama and George W. Bush tried it. Both times, U.S. diplomats, local business people, and lawmakers called it an expensive failure (paywall). Operation Phalanx cost $145 million for 14 months, while Operation Jump Start cost $1.2 billion over two years. Both operations took resources from other Department of Defense projects, while failing to establish a transparent US-Mexico border security policy, the Government Accountability Office (GAO) said in a critical 35-page report. State Department officials worried the operations would hamper their cooperation with Mexican law enforcement authorities, the report said. 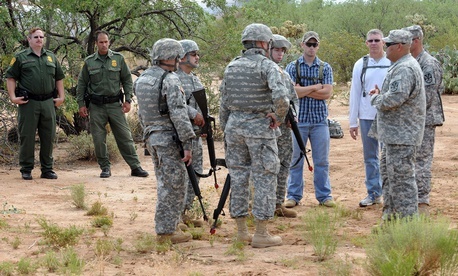 The Customs and Border Protection is responsible for upholding immigration law. The new troops on the border aren’t expected to enforce those laws either, a CBP official told the Journal. Instead, the highly-trained U.S. military personnel are expected offer logistical support, like building tents.